Book One: (8.5 x 11 color) covers my thinking that artists “save” something from being forgotten. I thought this focus would be something everyone can relate to in today’s world of forever changing views, new technology, and global change. I noticed that artists work to bring something that is hidden into light. That their way of seeing our world opens us to new ways of being and thinking. Different perspectives help to bring about change. Book Two: (8.5 x 11 color) Spotlights couples and the way they collaborate. Is if just as a couple or as artists too? And how does this type of relationship function and affect their lives. When I hung the show I was very pleased to see how each couple complimented each other not only in being a couple but in the art they created. Book Three is currently being reconsidered. Book Four: (5.5 x 8.5 black and white) Spotlights Southern California Artists their art and story. The focus of the book was to write a story, 500 to 1,000 words long and to share a life experience NOT related to or mention art in any way. As artists it seems we are always talking to and about our lives as artists. My intention was to help move the focus more to the history of the artist as a combination o f life experiences. We are more than our art… we are our story. There are 90 artists and 280 pages to read through. 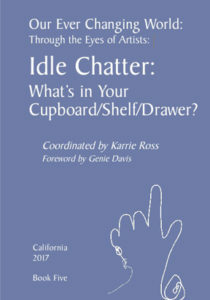 Our Ever Changing World: Through the Eyes of Artists: Idle Chatter: What’s in Your Cupboard/Shelf/Drawer? There are 18 artists and 64 pages to read through. 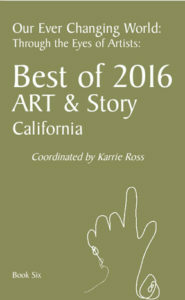 Book Six: (5.5 x 8.5 black and white) S California Artists their art and story. The focus of the book was to write a story, 500 to 1,000 words long and to share a life experience. The previous books has a basic theme, I have now moved away from that and will now be spotlighting Art & a Story by the year. My intention is to help move the focus more to the history of the artist as a combination of life experiences. We are more than our art… we are our story. There are 32 artists and 100 pages to read through. Book Seven is currently being reconsidered. Book Eight: (8.5 x 11 4/color) “The Women’s March was a worldwide anti-Donald Trump protest on January 21, 2017, to protest legislation and policies regarding human rights and other issues, including women’s rights, immigration reform, healthcare reform, the natural environment, LGBQT rights, racial equality, freedom of religion, and workers’ rights. The rallies were aimed at Trump, immediately following his inauguration as President of the United States, largely due to statements and positions attributed to him regarded by many as anti-woman or otherwise offensive. It was the largest single-day demonstration in U.S. history. There are 100 4/color pages of photos documenting the event in Los Angeles.